Corporate archives are often seen as a thing of the past or a burden to care for and maintain. Many teams and departments at fortune 1000 companies don’t even know their company has an archive, let alone know what’s in it or why they would ever use it. This is where the role of a corporate archivist is changing and emerging as a critical position. As companies see value in their heritage and history, there has been a race to digitize archives to preserve artifacts. While digitization is an important first step in the new era of archives, companies are still struggling with how to preserve the stories and context that go with these artifacts. Without these vital elements it’s hard to assume employees will know how to use the content in a corporate archive. Enter Levi Strauss and Co., and company historian Tracey Panek. Not only has Tracey been digitizing their rich history of garments, she has been collecting and curating the stories that accompany them. Looking at a gallery of jeans you would never know Bing Crosby’s denim suit was actually the origin of the term “Canadian Tuxedo”, or the 90-year-old leather jacket tucked away in the safe was actually owned by Albert Einstein. Imagine being a Levi Strauss and Co. marketing team member and idly glazing over these pieces of clothing not knowing that context! Knowing those stories is pure gold for employees. It not only tells them the story of the brand but gives them inspiration, sparks imagination, and facilitates strategic brainstorming. To this point, Tracey recently paired these stories with physical Levi’s garments in the reopening of The Levi Strauass & Co. Vault in San Francisco. 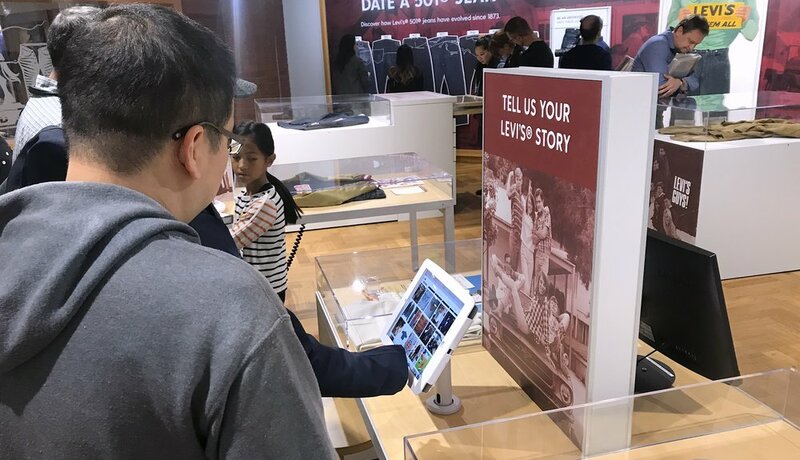 The Vault is open to curious visitors as well as employees who walk in and out of their HQ everyday.While most of the artifacts on display have historical significance and are attached to a famous celebrity, The Vault also gives visitors a chance to record their own Levi’s stories. Enwoven’s platform is installed at one of the walk up displays where visitors can view other people’s stories or record their own favorite memory. The experience is unique because it presents stories from the past while weaving in the ones from the present. Famous celebrities’ stories intertwine with those from customers and employees, painting a vibrant picture of the Levi Strauss & Co. brand. This is the next evolution of corporate archives, bringing stories, not just artifacts to life. Congrats to Tracey for putting together an amazing experience and thinking about how employees and customers will interact with the next evolution of archives. Empower your teams with a story driven archive.